A motorcycle or boat battery that is not needed over the winter is usually charged before being put away for the winter, after which it remains standing unused for months on end. As a result, it accumulates deposits of lead sludge, which can result in reduced capacity or even complete failure of the battery. If you don’t keep active, you rust! To avoid this, it’s necessary to keep the battery active even during the winter. This circuit does such a good job of exercising the battery that it doesn’t have to be recharged during the winter. It only has to be fully charged again in the spring before being used again. 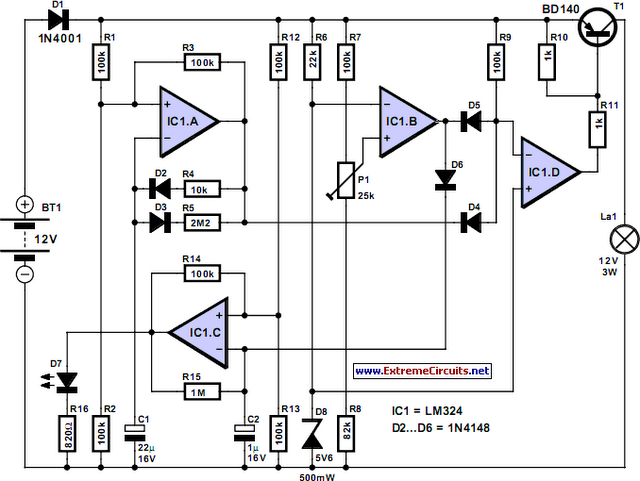 IC1.A is an astable multivibrator with an asymmetric duty cycle. The output is High for around 0.6 s and Low for around 40 s. IC1.B is wired as a comparator that constantly monitors the battery voltage. Its threshold voltage is set to 11.0 V using the trimpot. As soon as the battery voltage drops below this value, the comparator goes Low and D6 is cut off, allowing the second astable multivibrator IC1.C to oscillate at approximately 1.2 Hz. LED D7 then blinks to indicate that the battery must be charged. As long as the battery voltage is greater than 11 V, IC1.B is High. IC1.A is Low most of the time, and in this state D4 conducts and the inverting input of IC1.D is Low. This means that IC1.D is High most of the time, with T1 cut off. T1 only conducts during the 0.6-s intervals when IC1.A is High. In this state it allows current to pass through the lamp (12 V / 3 W), which forms the actual load for the battery. After this, darkness prevails again for 40 s. The average current consumption is approximately 5 mA. At this rate, a relatively new 40-Ah battery will take around one year to become fully discharged. However, this can vary depending on the condition of the battery, and it may be necessary to ‘top up’ the battery once during the winter.